— Space shuttle Endeavour's crew of seven American astronauts are spending Thanksgiving on the International Space Station today, sharing a traditional (well, almost) dinner with the outpost's three residents and offering their gratitude to those who got them there through a small, but special payload. "They sent us up with enough meals for the shuttle crew for Thanksgiving, with turkey and cornbread dressing, a cranberry dessert, and candied yams, and... green bean casserole," STS-126 mission specialist Stephen Bowen described on Tuesday during an in-flight media interview. 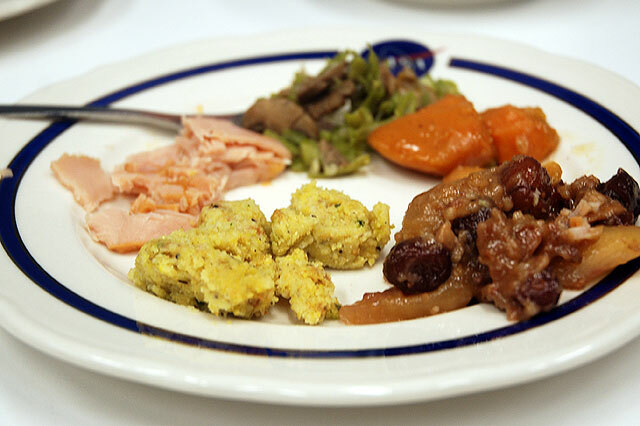 "Since then, we've been kind of collecting food now that we're going to be here with the ISS crew, and now we are going to have enough food for everybody onboard, which is part of Thanksgiving anyway, sharing what you have." 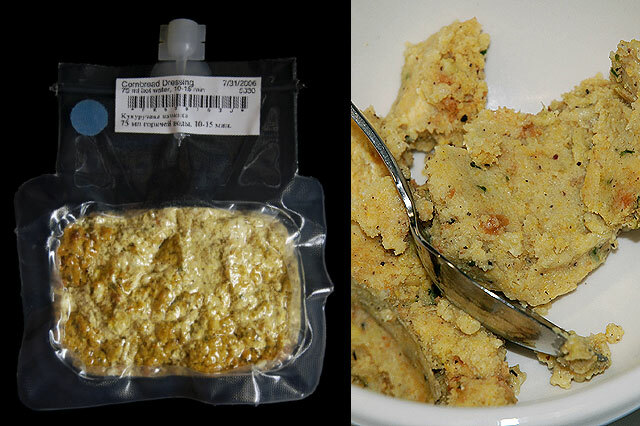 If the thought of a space food Thanksgiving brings to mind squeeze tubes, think again. This is not your father's three- course astronaut dinner. 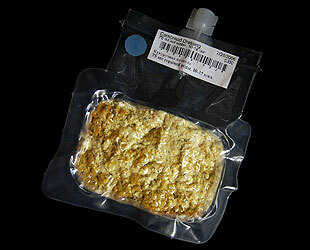 "It may be called space food, but it is actually very good," added Endeavour's commander Chris Ferguson. "A lot of it is thermostabilized, a lot of the meals come from the military and it's food like you and I enjoy at home. I'm from the Navy and I like Navy food, and I enjoy space food as well." Don't let Ferguson fool you, though. 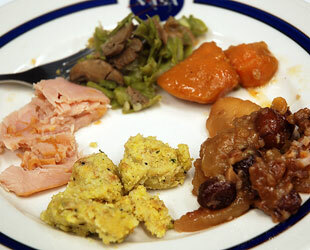 There is something missing from his ideal Thanksgiving meal aboard the ISS. "I like the white meat with the gravy, that's my favorite," he admitted in a pre-flight interview with collectSPACE. Though their menu includes smoked breast meat, NASA hasn't yet perfected the art of flying gravy. "It is a little more challenging when you can't open every thing up in the same way and put dressings on," explained pilot Eric Boe. "It is usually bunched together but that is usually how it ends up on my plate anyway, so I am sure it is going to taste great." For mission specialist Shane Kimbrough, it is not about the dressing, but how the turkey is prepared. "Just a fresh one that came out of the oven, which we won't have," he shared of his favorite kind of turkey. The ISS's galley has an oven, but its more of a food warmer than it is capable of baking. "I am not sure I am going to get my wish," resigned Kimbrough. And though she said she prefers dark meat, Heidemarie Stefanyshyn-Piper was more concerned about the sides. "I like my stuffing," she stated proudly. "I don't know what makes it special, but I think it is the way I like it. I use bread cubes instead of bread crumbs. I know some people will sometimes run it through a food mill or something, but I like the chunkiness. I put celery and onions, and I even put a little mushrooms in there. I just like the textures in it. And it's mine." According to Stefanyshyn-Piper, there just wasn't enough time before the flight to get her stuffing packed for launch. What did make it aboard Endeavour were small souvenirs intended to convey the crew's gratitude for those close to them. "I have brought a lot of things for the folks who worked on this mission," Ferguson explained. "The first time I flew, I brought the things I wanted, like the flags for my home school, a t-shirt for my high school. But I have asked a lot of the folks who worked very hard this flight, and there are thousands, but the folks who we worked day in and day out, 'Is there anything I could take for you on the shuttle?'" "That is my way for just giving a little back," he shared. The crew members, as well as divisions within NASA and its contractors, can request to have items flown inside the Official Flight Kit (OFK). Limited to two cubic feet (0.057 cubic meters) in size, the OFK is flown on every mission as a means of providing a token of gratitude to the groups that contribute to the mission's (and astronauts') success. Boe, who like Kimbrough and Bowen was making his first spaceflight, wanted to give back to the organizations that prepared him to launch into orbit. "From Georgia Tech, I have a shirt that is going up, and I have a cap from the Air Force Academy." He also took "a few odds and ends from the the units I was in or programs that I participated in along the way." Stefanyshyn-Piper carried items for similar reasons as she did on her first mission, STS-115, in 2006. "There are similar items but they are different. Like on the last flight, I flew a swim cap for my son's high school swim team. Well this time, I have got one for his college swim team. And like I flew last time in honor of my father, I have a small Ukrainian flag." "Kind of have to spread the wealth a little bit to give other people the opportunity to have a flown item in space," she added. And as the saying goes, sometimes what comes around, goes around. "I'm bringing up my spoon," STS-126 mission specialist Don Pettit told collectSPACE. "It's a Russian spoon and it has this really long handle." Pettit was gifted the spoon, which has come to be known as the "Spoon of Exploration", during his 2002 five-month stay aboard the space station. Since then, he's taken it with him on his other NASA expeditions to Antarctica and elsewhere. "It's designed for on-orbit use. It's really good for digging down into a deep pouch that has food in it so you don't get your fingers all gooey," Pettit described, which should be perfect for the Thanksgiving meal he'll be sharing with his crewmates. The following is the STS-126 Official Flight Kit manifest, as provided by NASA. Inventory numbers that are missing indicate items that were removed prior to launch. Items 23 through 78 are manifested at the request of the STS-126 crewmembers. Items 81 through 101 are manifested at the request of the Space Shuttle Program Office and Payload Customers.